America, admit it. You love O.J. There was a scene in the gangster movie, "Hoodlum," where a mortician looks at Bumpy Johnson, played by Laurence Fishburne, and tells his son, "That man is good for business." Martin: "We love nothing more than watching another fool make a mess out of his life." Of course, that's because Bumpy went to war with another gangster, Dutch Schultz, leading to a bunch of dead bodies. The mortician didn't sweat hearing gunfire. For him, the "cha-ching!" meant money from funerals. And that's what I'm hearing right now as we deal with O.J. Simpson's arrest in an alleged armed robbery in Las Vegas. Right now, as I type, lawyers across America are dusting off their resumes and DVDs, firing them off to talent heads at all the cable networks, looking to make their mark by cashing in on O.J. mania. Oh, yeah, don't think for a second that I'm stretching here. Everybody saw how many lawyers are now TV hosts, commentators and pundits. O.J. is a living, breathing reality show. Anybody and everybody who has written a book or a documentary related to O.J. will be on radio and TV, expounding on a man many of them really don't know. But hey, they've got books to sell! You don't think this is a big deal? When Clark County Judge Nancy Oesterle -- the appointed Las Vegas "media" judge -- approached the microphone yesterday, she commented that she had never seen such a spectacle. Yeah, I'm sure some will say, "It's you, the media!" But show me one media executive that ignores the O.J. saga, and I'll show you a guy or gal without a job by the end of the week. 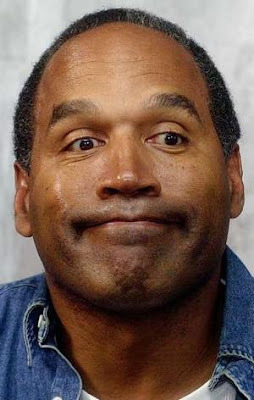 Remember all of the righteous indignation we witnessed when O.J. was going to publish his book, "If I Did It"? People howled, protested and blasted Rupert Murdoch and ReganBooks for days. And Judith Regan, who orchestrated the deal, which included a TV show, was ousted in the wake of the scandal. And when the Goldman family got the rights to the book and promised to publish it, Amazon.com and Barnes and Noble treated it like a skunk, saying they would not promote it, and some demanded they not carry it in their stores. Guess what? Over the weekend, the book hit No. 1 on Amazon.com and BarnesandNoble.com. So, who exactly is buying the book? That's right. You. It's you, America. You buy the books about O.J. You watch these TV shows that go wall-to-wall O.J. You buy the magazines that feature him on the cover. And yes, we in the media churn this stuff out like clockwork. We are all rolling around in the slime of celebrity justice. People need to stop with their high and mighty attitude and own up to the fact that we love to scream on the roller coaster O.J. takes us on and that includes my friends in media. He is a riot, always getting into trouble, and we love nothing more than watching another fool make a mess out of his life. So, let the games begin. Let's pop some popcorn, grab some snacks, and watch another wild and crazy trial. Sure, this isn't a double-murder trial. But we'll go through every detail of that trial. Someone will drag Kato Kaelin out from under a rock -- likely someone else's -- that he's been living under. Maybe that barking dog will be interviewed on a cable TV show. Enough with our pretend indignation. We might as well own up to the reality that we can't get enough of O.J. Simpson. So let's enjoy him as long as he's here to kick around ... and make a buck off of.